It’s a new week, and we’re recovering from Awesome Con! Expect some photos and general thoughts for the third year of the convention. While you wait for that, here’s some news to keep you busy. CBLDF – Iran Combats ISIS With Cartoon Contest – Very cool to see and hear about! Calgary Herald – Hundreds of comic books stolen in break-and-enter – Horrible news. If anyone has any information that can help, do come forward. It’s a new week, and new week for comics! Tonight we’re talking Marvel and Netflix‘s Daredevil on Graphic Policy Radio. You should listen in. Until then, check out the news you might have missed below. BBC News – Islamic State: Fighting fundamentalism with comic strips – There’s a lot of comics being used. The Outhousers – WITNESS: Comic Book “Artist” Kurt Busiek Battles the Forces of GamerGate – Good documentation about the absurdity of it all. Bleeding Cool – Frank Cho Donates $1000 Sale Of Spider-Gwen Art To Domestic Violence Charity – Good on him! While bombs are being dropped, and bullets are flying in an attempt to stop Islamic State in Iraq and Syria (ISIS), others are taking a more peaceful approach to shape the hearts and minds of those on the ground. 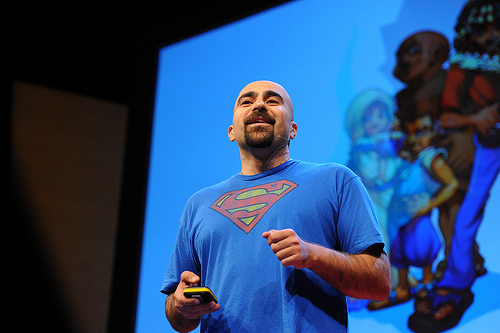 Suleiman Bakhit is a Jordanian social activist who thinks we can fight the terrorist organization with comics books. Bakhit thinks that narratives and myths are a key. Bakhit thinks that a toxic shame is a lot of what drives the violence. Healthy shame is a source of learning, it lets you know boundaries. Toxic shame says you are unworthy as a human being, you are unworthy of human connection. This leads to violence in an attempt to replace that toxic shame with pride. After Bakhit began publishing his own comics, he was attacked with a razor blade by extremists. I had to cauterise my own wound with a piece of steel. But two good things came out of this. One, my dating life improved exponentially. And the second thing was that I realised that they were trying to mark me with shame, to transfer their own shame to me, and replace it with pride. The idea of taking on the terrorists with comics came from asking kids who their heroes were. When first asked, they named people seen in extremist propaganda. Bakhit then gave out free comic books. Three months later, those extremists were replaced with comic book characters. The simple issue as he sees it, a huge need for positive role models and positive narratives. Fight extremist propaganda with a counter mythology filled with men and women, and most importantly make it positive and personal. Bakhit ended his interview with this thought to ending the extremism. The best way to accomplish this. The best technology we have to cultivate heroic motivation is this medium right here. The comic book.